594 kHz Bulgaria now closes down at 2100 UTC. In Finland FRCN Kaduna has been heard after 2100 UTC by Mauno Ritola on this frequency. In Växjö the fq is covered by HR-Info. 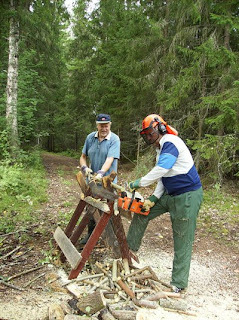 (Jan Edh, listening in Fredriksfors) JE & DA cutting firewood for the coming winter DX season. 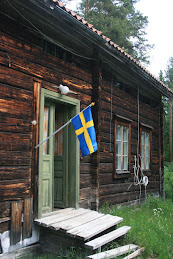 For the first time in more than 3,5 month I tried the airwaves in Fredriksfors again (together with Rolf Larsson). Well, it was perhaps as expected (in other words rather lousy).The visits earlier this summer has been to stock up firewood for the coming season. And more is to come, we hope another good season...In the afternoon July 15th there had also been a club meeting for DRAK where mainly the hams had talked about their antennas and BBQ.When I arrived at a later hour only Rolf Larsson was left, and we started to listen after sunset.Up to 23 UTC there were no sign of Brasilian or other TA-signals. On 1566 I looked for the Italian but there was TWR Benin very dominant.Start again 01 UT with a slight ”top” around 02 UTC. Signals on several channels but most of them very weak. Except from the identified ones these could be mentioned: 920 (presumed Paraguay), 950 (Argentina? ), 1130 (Spanish with news), 1180 (Rebelde? ), 1290 (YV or Murialdo? ), 1390, 1400 (religious, could be Harbour Light), 1470, 1500, 1620 (Argentina? ).